Happy Friday friends! What are your plans for the weekend? Evan’s on a boys camping trip so I’m having dinner here with a girlfriend tonight and I’m looking forward to catching up over pizza and several glasses of wine. 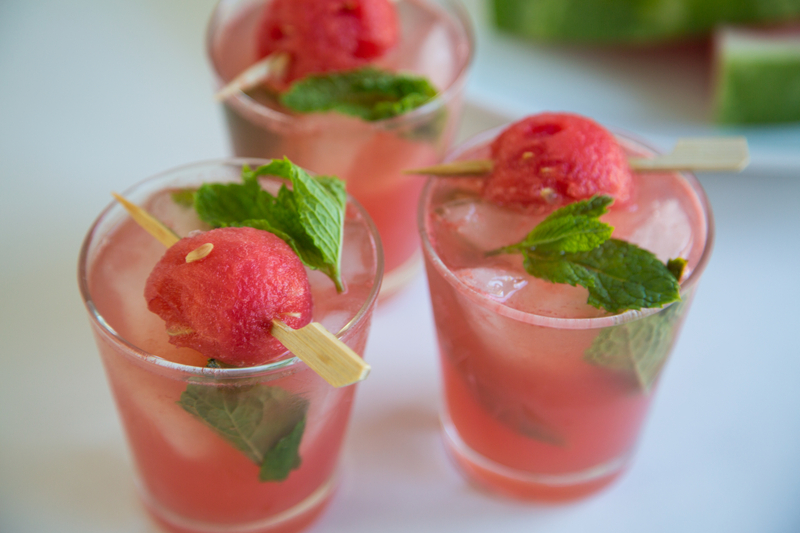 On Sunday, I’ll be serving up this refreshing minty watermelon gin punch at the Joy the Baker & Bottle Stock Pop-up Shop and Bake Sale!! If you’re in LA and want to come, RSVP at BSBakeSale@gmail.com for the secret location (Space is limited, so hurry!). If you’re not able to stop by, don’t worry I’ve got you covered. Happy Weekend! Working in batches if necessary, purée the watermelon in a blender or food processor and press the purée through a strainer*. (*NOTE: You can forgo this step with a juicer). You’ll need about 4 cups of juice—it’s fine if there’s some pulp in the juice. Chill. Put the lime juice, simple syrup, and mint in a 3-quart serving pitcher or a punch bowl and mash the mint thoroughly with a muddler or the back of a wooden spoon. Add about 4 cups of ice, the gin, and the watermelon juice and stir. Serve over ice. 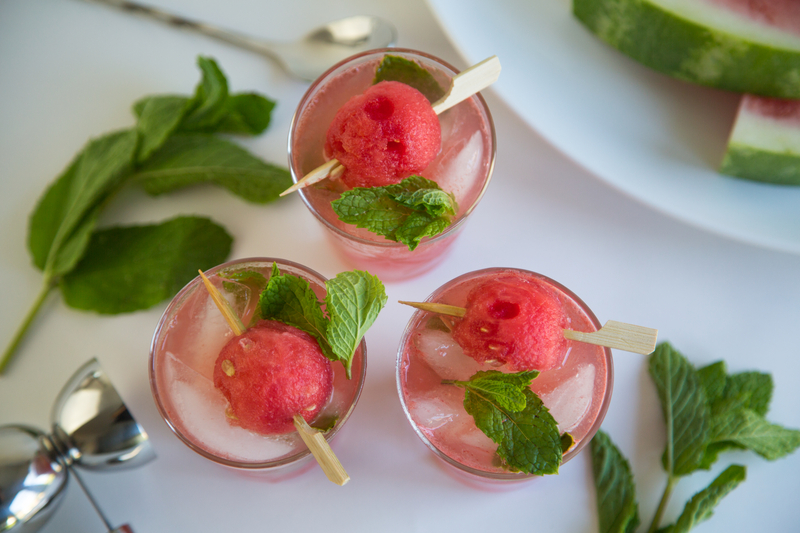 Garnish with balled watermelon and mint sprigs. 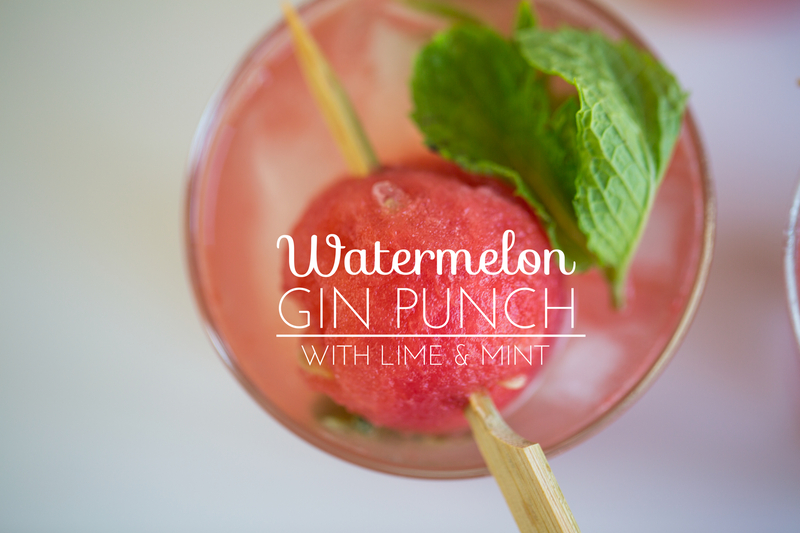 I love my gin and I love my watermelon…definitely on my list :)). Thanks for sharing. This might be the prettiest drink I’ve ever seen! Love pink and green. I bet it taste awesome too! Looks so cool and refreshing! Yum! Yum! I am definitely going to make these! It will be nice and refreshing in this Austin heat. This look amazing. I’m going to get a watermelon and serve this at my Saturday BBQ. Thanks for posting this recipe. I’m going to do this….tonight! Thank you for the idea. Totally! Vodka would be super tasty! You can also replace the alcohol with soda water for a refreshing spritzer! Happy weekend! I’ve made something similar but with rum. Great idea to try it with gin and I love the garnish! I’m in love with fruity drinks right now. Tis the season! I just made a grapefruit lemonade and nearly drank the entire pitcher. Love your recipe! It looks so good. I am a huge fan of gin, and if you haven’t yet tried it, Hendrick’s is amazing. It is infused with cucumbers and rose petals. I have a tough time encouraging my buddies to drink gin, but hopefully your recipe will help to enlighten them :). Thanks! Thank you for sharing at today’s pop up! These were so delicious! J’ai soif d’un coup ! :) You make beautifull pictures, I love your blog!